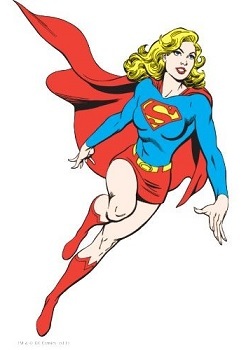 We have found some of the best authentic and realistic Supergirl costumes for women out there because although everyone knows and loves Superman and the guys have always been able to dress up as their favourite Kryptonian no problems, there has always been less choice for women, but now the girls fortunately also have some great options because with a new Supergirl TV show she is experiences renewed popularity and exposure, which means there are more costumes than ever to choose from. But there lots of great costumes out there and it’s hard to find the best one that is right for you, so at Superheroes Central we make our business to shop around and find you the best stuff and make your experiences super positive ones, we’ve done this by selecting costumes that look great, and that people have rated highly, showing that they’ve enjoyed their experience with their costume. 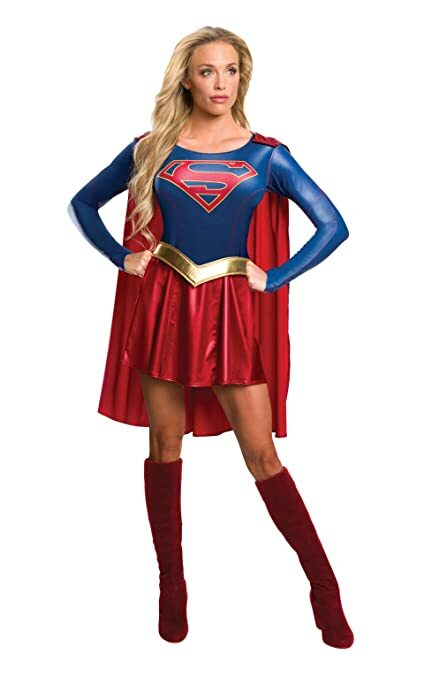 We have got some great Supergirl costume ideas for adults, we always try to include a quick and easy outfit for people who just want to have a little fun, and we found a really cute Supergirt T-Shirt and cape costume which people loved. We also have a pair of the best authentic Supergirl costumes we could find, they are very similar looking, but they both look amazing and we couldn’t choose between them, and they both had outstanding reviews, so we included them both and you can have a look for yourself and see which one you like the best. Also included is an amazing high end realistic Supergirl cosplay costume for those who serious about dressing up as their favorite superhero. At Superheroes Central we understand that for some people costumes are serious business, and that’s why we included this authentic Supergirl cosplay costume. This amazingly detailed costume is actually custom made, where you send away your measurements and they make it to size, which is a very exciting selling points. another great point about this costume is the attention to detail and the absolute realism of the costume, it looks like it came right out of the movies. It is an incredibly realistic looking costume complete with red cape and skirt, gold belt and blue top with the more modern emblem. All the fabrics used on the costume are of a very high quality and this product comes with extremely costumer satisfaction ratings. Supergirl boots are not included and need to be bought separately. And so for a high quality custom costume made to size that costs a little more without being exorbitant, this is the best and most authentic Supergirl cosplay costume out there. And for fans of the classic look we have this authentic Supergirl costume for the adults, much more traditional looking the shirt has a nice velvet look and feel to it, and is emblazoned with the original logo, another great thing about the costume is the stylish looking material used on the cape skirt and boot tops, a glorious shimmering red along with the golden belt it really does look amazing. This is another costume that received hundreds of positive reviews, but a lot of people weren’t as impressed with belt, with some people opting not to wear it at all. But even considering that people still loved it, as do we, which is why we added it and thought it was one the best Supergirl costumes for the adults that we found. As we said earlier Supergirl is actually enjoying renewed popularity at the moment thanks to the new action-adventure TV show of the same name starring Melissa Benoist , and here is one of the best Supergirl costumes based on the show. 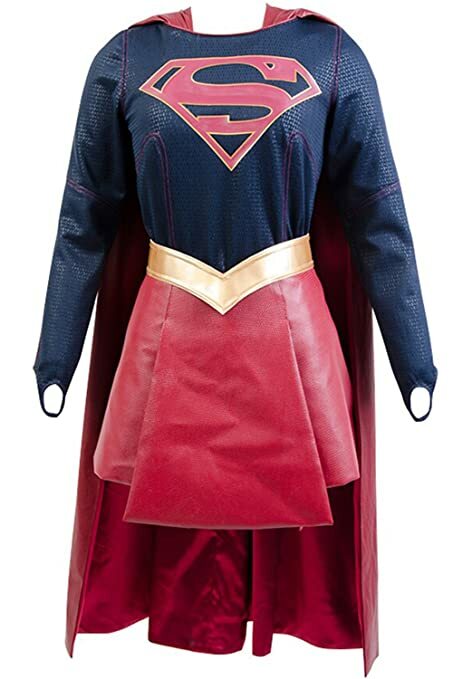 As you can seen this is a modern take on the classic costume design, it comes with flowing red cape complete with the Supergirl emblem , aswell a short red skirt and golden belt, but the top is a little different as the material is fashioned to look sleeker and shinier and with the family crest on the chest having a solid blue background as opposed to the traditional yellow infill. People loved this costume as we said earlier, giving it rave reviews, but it is worth noting that boot tops or boots are not included and must be bought separate so if you need some Supergirl boots click here. It really is one the best and most authentic Supergirl costumes for fans of the TV show. This Supergirl T-shirt and cape costume is perfect for women who just want to a part of things, whether it’s their kids birthday or trick or treating with them, a really fun solution which gain you lots of attention and compliments without all the effort and trouble of getting a more elaborate costume. This polyester T-shirt has a classic Supergirl print on and has an awesome red cape which is completely detachable using Velcro patches on the shouders. 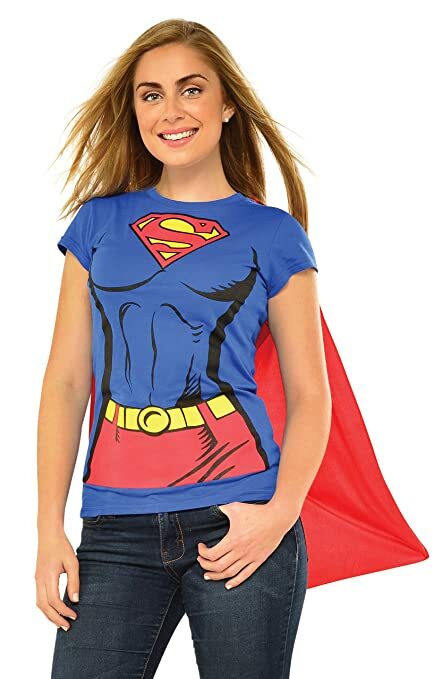 It’s also a great costume solution for women who just out with their friends or at an office party where the smaller and more readily available Supergirl T-shirt and cape costume works better. Several hundred people have reviewed this costume and have nothing but good experiences and fun and gave it a very high rating, so it’s worth considering if you want something quick and easy. With this awesome You Tube video that we found of the many and varied different Supergirls and their costumes, we thought it was the perfect way to show what any fan of comics knows, nothing is ever final and nothing is safe from being retconned(that’s where they change the previous official story making the new official story the only one that counts) and there has been quite a few different stories and characters over the years, and this guy doe a great job explaining it all in an awesome and entertaining way, so have a look and see which Supergirl costume you like the best. We hope you liked one of the great authentic Supergirl costumes we found but we thought we’d also tell you abit about how Supergirl started in the Silver Age of comics(as opposed to her revised origin story in DC’s New 52 relaunch) she’s a classic superhero in her own right first appearing in Action Comics #252 in may of 1959, where she was created by writer Otto Binder and artist Al Plastino. Her name is Kara Zor-El but goes by Linda Danvers on Earth, and her tale of survival differs from that of her famous cousin. When Krypton exploded a large chunk of the planet containing Argo City was blown out into space(it was 1959 after all), several hundred Kryptonians survived, amongst them was Zor-El the brother of Superman’s own father Jor-El, and for a time it was possible to live there, although not indefinitely as the planet was transforming into Kryptonite(and we know what that does to Kryptonians right). So Jor-El met Alura-In-Ze and they had a daughter, Kara. But disaster struck and meteorites destroyed a large portion of the city, and together Zor-El and Alura made the decision to sent there teenage daughter to a safe have much as Jor-El had done years before, they selected Earth knowing that her cousin was already there and that she would gain fantastical powers aswell and so she was put into an escape pod and sent to Earth. It was presumed her parents died along with the other remaining survivors(but this is the comics and they escaped to an alternate dimension named the Survival Zone, from which Kara would later rescue them). So upon reaching Earth, Kara did indeed gain all the powers of her more famous cousin flight, invulnerability, super hearing, super speed, super strength, x-ray vision and heat vision to name just a few. Although wary at first, despite the fact she was wearing costume similar to his own and sporting his family crest, he didn’t know whether she was friend or foe, Superman was overjoyed to that some of his family had survived, he helped her adapt and created the identity Linda Danvers setting her up in college, although she would fight crime as her costumed alter ego Super Girl in her spare time, teaming up with other superheroes like Batman and Robin and the rest as they say is history.